The house was built between 1755 and 1760, in the form of a triple-axis quadrant with individual facade formation and an upper level core. The door axis is based on a semi-circular curved plan atop “Tuscan pillars” with diglyphs. The parapet is ornamented with “Rocaille” reliefs, while the flanks of the door axes are borne by Corinthian semi-pillars. In this form, the house was first mentioned in Record no. 377 for 1757, indicating that it formed the security for a mortgage of “500 guilders of imperial currency” during 1755/56. It was built on the former “Gaismarkt” by the hosier Georg Friedrich Stäubensnd and the master carpenter Johann David Haselmann, both local burgers. However, according to legend, the “rulingcountess” Marie Caroline Sophie vonBrandenburg-Culmbach, whoresided in her family`s Erlangen Castle, builtthe house as a huntinglodge. 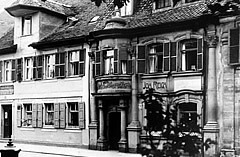 According to this tale, the house wasoccupied by her Master of Forests, who kept the stud near the ridingpath, which – until 1843 – extended from the southern section oftheGaismarkt – which is called Theaterplatz nowadays – which was nearthecastle whose noble mistress – known to be a passionate rider -gatheredher riding and hunting friends together in the “hunting lodge”. Localhistoryresearchers investigated the legend, rifled through oldchronicles and -instead of the Barndenburg-Culmbach countess -discovered a Mrs.”Starkgräfin” ( nee Deckerin), who is mentioned asthe subsequent owner in 1762. In addition, the “Master of theForest” turned out to be a “Post Master”called Wels, who inherited the property in 1768. Itis hardlysurprising that this beautiful house should be the stuff oflegend,because the building was and is architecturally unique. Known in Erlangen as the “Little Rococo Castle”, the buildingpassed down through the generations until it was inherited by Mrs.Kunigunde Eleonore Kraft, the daughter of Mrs. Gertrud Barbara Wels.She left it to her nephew, Mr.Albrecht Heinrich Julius Wels, amagistrate chancellor. It was then offered for sale in the ErlangenCity Gazette of 16.12.1851. The next owner mentioned is Johann AdamBerthold. a privatier from 1856. According to the 1875 City Directory,Johann Adam Hildebrandt, glove manufacturer, was the owner from around1870 to 1875. According to the 1876 registry of deeds, the property wasthen owned by Mr. Konrad Dietz, glove dyer. Around 1876/1877 theproperty was purchased by the baker Friedrich Herzog, who then sold itin 1878 to Mr. Anton Götz, a specialist trader. The “Lodge” remainedin this family through inheritance from 1878 to 1896. It was thenpurchased by the Reich family, and was passedon through the familybetween 1896 and 1951. Almost all the ownersmentioned here were descendants of the Huguenots who immigrated to Erlangen in 1686. There are now only two families left in Erlangen who can trace their names back to the Huguenots: the Mengin and Vache families. The paternal great-grandfather of the Krettner family – the carpenter Georg Mechs – was also descended from the Huguenots. The trades originally introduced by the Huguenots have practically disappeared today, but were alive and well in the days when the house was owned by the families of whom we write. 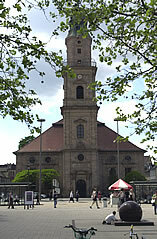 The area where, in 1686, Huguenots from around the world, as well as from many parts of Germany, settled was known as Neu Erlangen; here they waited to return to France. The hope of a return was kept alive until the start of the eighteenth century, when they started to makea life for themselves here: only after the French Revolution were they tolerated in their homeland. Thus, there were 317 Germans and around 1.000 French in Neu erlangen at that time. This ratio balanced itself increasingly out, and was in fact reversed in the next 20 to 30 years. Although the French reformers lived in colonies at the beginning, they were more and more assimilated into their environment, and by 1940 the population was no longer divided into those of German and French descent. The Huguenots had adopted German as their lingua franca even before 1750. Their alien character dissapeared along with the general disappearance of the French language. In 1785 a contemporary described Erlangen as a blooming city where trade and manufacturing flourished and the residents lived in harmony. The numerous refugee descendants had finally come to terms with their new home, and had even achieved commercial success. It was thanks to the Huguenots immigrants that Erlangen – formerly an agricultural society – become a commercial centre whose importance extended beyond the local region. By the end of the 18th century the French presence was practically undetectable, and the factories which they had established in Erlangen had disappeared. Erlangen´s growing profile as a university city and royal residence resulted in a shift of emphasis. The term ” Huguenot City” only really gained currency in the 1930s. In the 19th century the “Huguenot Well” in the castle grounds was only thus named after first being called the “Great Fountain” and then “Emigrants Well”. After 1936, the “Huguenot Play” was also performed in the catle garden every two years, in order to remember the emigrants. In 1951, the Rococo Lodge was bought by the violin maker Artur Teller, who came from the Sudeten part of today `s Czech Republic, and practised his craft here until 1960. He had an artistic appreciation of historically valuable artefacts, and it is thanks to that appreciation that the decaying house was rebuilt with the help of architect Paul Kupfer, preserving the facade which was under a protection order. Even in those days, conservationists realised that the house was something special. The City of Erlangen, as well as the Heritage Offices in Munich and Ansbach, reached into their pockets and provided subsidies to maintain the precious facade – however, the subsidies did not cover the actual costs. The Rococo House is the only completely rococo structure among Erlangen `s great houses; its graceful forms distinguish it from its more sober environment. Only the facade was preserved. 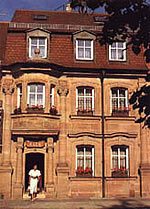 Behind the facade is today `s modern Hotel Rokokohaus, although the rococo style of the facade is carried into the hotel `s interior. That is how, in 1965, a hotel was created which is now famous around the world, amd which is still managed by the Krettner family, descendants of Mr. Teller: the HOTEL ROKOKOHAUS. In 1965 guest were offered 15 double and single rooms; today there are 17 singles and 20 doubles behind the graceful facade. 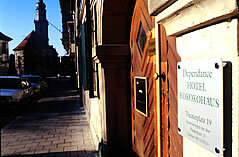 There is also an annex in Theaterplatz 19 – also subject to a protection order – where there are another 5 non-smoking rooms. As soon as you enter the annex, with its thick timbered beams and its uniquely spanned ceiling, you know that you `re entering a building with historic charm. 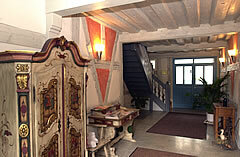 An old-fashioned staircase leads up to individually decorated rooms. All rooms have satellite TV, minibar, telephone, internet connection, comfortable underfloor heating and spacious bathrooms tiled in pale colours. Yet each room also has a certain individual charm. © 2019 Hotel Rokokohaus Erlangen. All Rights Reserved.